Paul Martino and Chris Law, both founders of Tribe Networks, have been hanging out at the NSV offices and working really hard on their new startup, Aggregate Knowledge. They have a recommendations web service, WSRelater, live now on the web. I've played with it, and it's awesome. There is some impressive math behind the engine, and the number of cool things I can think of to do with it is rather long. Keep them on your radar screen. After 49 empty hours, we've got data through 1pm today. Urchin works again! Google customer service both called and emailed us yesterday as well, apologized for our troubles, and offered to refund money to us. I told them that a refund was nice, but what's really important is that Urchin works. To me, that means our website data consistently available with no more than 2-3 hours' delay. The big issue is not one startup's angst about its temporary lack of web stats. The big issue is whether it's possible to reliably deliver complex software over the Internet at all. Google is the biggest player in this space, with vast resources of engineering, bandwidth, and servers, but everyone from Salesforce.com to Zvents is attempting to deliver significant software functionality remotely over the Internet. We are asking our customers to bet their businesses on our ability to deliver. "Flaky but free" simply does not cut it any more. How many of you out there rely on Yahoo or Google email for business-critical communications? What if it went down tomorrow, for 48 hours? What if Salesforce.com stopped working for 48 hours? What if Ebay or Adwords stopped working? Marketing campaigns, communications, and commerce grind to a halt, and real damage is done to real people and real businesses. Can this really work? The whole premise of the next generation of Web startups is that it can. Zvents is planning on embedding its calendars and serving events into a lot of other people's websites, such as early adopter LinkSV. If we go down, they have no events calendar on their site. As we grow, that customer reliance on us will grow to tens of thousands of similar sites, and if they have no data for 48 hours, there will be anguished screams that will sound very similar to my own post. I think it can work, but it's going to require not only a business model, but a lot of grownup enterprise kind of thinking, with SLAs and obligations and recompense for failure clearly laid out in contracts. Otherwise, the level of trust simply won't exist to create the very cool future that we're imagining and building right now. Zvents is an Urchin hosted customer. Yes, customer, as in we pay Google $200 per month to provide our web stats to us. We have been very happy with the quality of the tools that Urchin provides, but intermittently unhappy with the time lag it takes or our web data to appear, and the occasional gaps in our data (we are still missing two hours from last Monday). Google has been kind of OK on the customer service front. I don't know how many other people like us there are - people who paid for hosted Urchin before today's announcement. But I bet that all of them are pissed. I tried to log in to Urchin. Surprise! 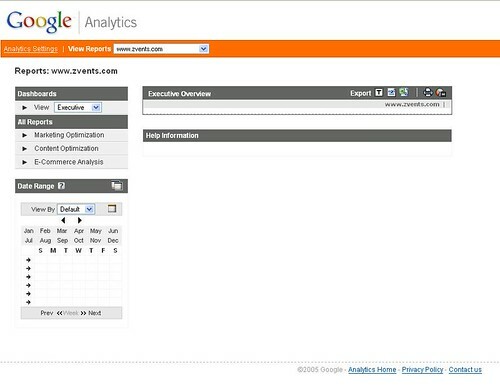 Urchin now resolves to Google analytics. I typed in our login and password, and I was informed that this account "has to be validated". As it happens, this is a special account just for Urchin and I don't havedirect access to the email address - a not uncommon problem in any organization larger than, say, one. After a few hours of fumbling around and swapping phone calls and emails, I get one of the other guys to send me the validation information. Next surprise: Because Google is switching to some damn unified login system, whenever I use the login for this account, it messes up any other Google logins I have. Apparently there's a way to pipe this login over to my Gmail account, but it's another hassle-filled step that I didn't have to take yesterday when Urchin JUST WORKED. Eventually I get in to Urchin. Urchin is getting slammed with traffic. We hear all this hoorah about Google's hundreds of thousands of servers and their ability to host applications, and all I can say is, if casual interest in a service you aren't even accepting new registrations for grinds you to a halt like this, you are nothing like ready for prime time. When I finally do get in to Urchin, I have no data since 3pm yesterday. That's 24 hours without data. Zero. Zip. None. I'm trying to run my business here, folks! Hello? It's nice that it's now free. But I was willing to pay $200 per month for a service that Just Worked. Google may be all excited about advertising business models, but there are billion dollars businesses built on charging other businesses $200 per month. Right now, I feel like Google doesn't care about me enough as a customer to tell me that they're changing a product I pay for. They don't care enough about me as a customer to make sure that my login doesn't change, or that they at least ask or warn me before changing my login. They don't care enough about me as a customer to make sure that the re-launch of their product doesn't dramatically impact the people who are already paying them lots of money. Google isn't acting like a real business, they are acting like an over-enthusiastic Golden Retriever puppy. Oh, they just knocked the vase off the table with their tail, but aren't they cute? Um, no. Google, grow up. 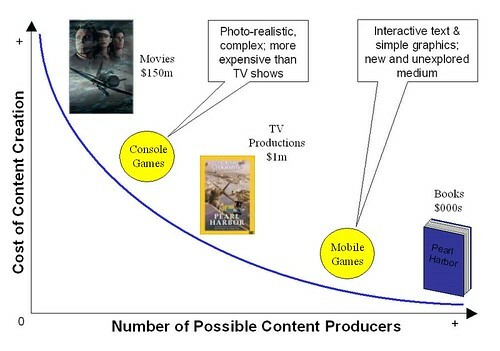 Consumers become producers of content, and niche content surpasses by orders of magnitude the value of traditionally labelled commercial television and film. The value is not anymore in the best seller or in the blockbuster. The value is in infinite choice of content and in the opportunity for the consumer to see content when she wants it: prime time is anytime, and anytime is prime time. - Production values are not yet up to ESPN's standard since the OLN only had two months to put the broadcast together, and viewers will notice. Media is valuable, because our time and attention is valuable. We all choose to consume media from preferred providers, and the two mechanisms by which we choose those providers are the talent on display, and the production values around that talent. I loosely define production values as "capital investments which make the consumption of the core content more pleasant, informative, or easier". For writing, production values include good web design, non-intrusive ads, reasonable colors and fonts (get busy, Andrew!) and so forth. For audible media, production values are things like the recording quality, background noise, the level of editing to remove slow or redundant sections, and so forth. For anything visual, the list of production values begins to be very long, and even more important. It's a cliche that no one watches home video, despite its existence for decades. The two areas where I can think of home video having real general media value are a) occasional "man on the spot" news clips (Rodney King) and "America's Funniest Home Videos". What links these two together thematically is that they're essentially random -- something either funny or important happened in front of a turned-on video camera, and the value of the content outweighed its lack of production quality. Here's a graphic that I put together in 2001 for a strategy I was doing for a mobile phone company. Any similarity to Web 2.0 standards is strictly coincidental - I've been thinking in power curves for a very long time. As you can see, based on the empirical data of a search I did on Amazon, there's a nice inverse relationship between cost of production and number of content items. Why is this? There are two dynamics at play. First, in any gathering of people to create something, some people are more talented than others. I participate in some small-scale local theater and performance, and when there are six people in a room, usually everyone knows that one or two of them are better than the rest. These talented people tend to like working with other talented people, and over a small amount of time, quite a sorting effect occurs. Pretty soon the talented gang invents a name, throws out a shingle, starts charging, and voila! the naescent MSM is born. When you add money into the equation, the effect is to enhance the differentiation. Perhaps a financier made money once, sometime, in a far distant past, by *not* seeking out the best directorial, writing, performing, and technical talent for his production - but I doubt it. When real dollars are at stake, people seek out the best, and then fund them. Those who aren't the best don't get funding. From movies to music to television to video games, this is an obvious trend even in relatively "new" media like video games. Example of the "talent self-clusters" point here, here, and here. Example of the "financier seeking the best talent" point here and here. I do believe that temporarily, at least, some barriers have fallen in our new world. Here I am, writing this blog. But my choice with this blog is very clear: I can either a) invest a lot of time in it to create quality content on a regular enough basis to develop a readership or b) I can get on with my real life, which is running a cool new startup called Zvents, and only post here occasionally because I feel like it, and not worry about becoming a media property. I am never going to out-do BuzzMachine in popularity or readership unless I put some serious work into the effort, which I'm simply not going to do. Therefore I will 98% remain on the "Consumer" side of the blog equation, despite my reasonable levels of inclination, ability, and empowerment to become a producer. Meanwhile, Jeff will sit on the opposite side of the equation, and take each successive step up the production values and monetization ladder which develops over the next few years, and in 36 months, it won't be possible to compare my blog to his with a straight face - if it even is now. Jeff will have, by dint of wildly disproportonate readership, a "blockbuster" on his hands, giving lie to the baloney in his recent post. Whenever anyone starts talking about new democracy in media, just remember that for the past 100 years, any normal person with about $50 to their name has been able to buy a typewriter and a sheaf of paper, sit down, and create a novel. For the past 100 years, being a successful novelist has been a well-paying, respected position. The fact that so few have managed to do this, despite the legions who have tried out of the near-totality of all who could have tried, indicates that there's something slightly more fundamental going on than big mean corporations holding back the little guy. That something is the rarity of talent, the social network clustering effects of production values, and the reality that all of our time is limited, and brands are a great way to short-circuit searching costs. The wonderment of the current age of the internet is not that the new winners will look any different than the old winners, but simply that a window of opportunity exists to make new winners at all. Analysis Ever the master of public relations, Microsoft has always been able to figure its way out of a tight spot with the use of a judiciously leaked memo. ...in the spirit of the excellent 500-word "digested reads" offered by some of our better newspapers, we give you the précis of the latest Gates and Ozzie memos. Then we'll put the whole affair in some historical perspective. Microsoft has always had to respond to innovators in the software business and seize the PR initiative. Ten years ago this December, I wrote a memo entitled The Internet Tidal Puddle in which I attempted to undo the damage caused by my book, The Road Ahead, published just three months previously. In The Road Ahead I failed to mention the internet at all. The same month, Netscape had floated on NASDAQ, creating the largest ever first day gain. Clearly, there was a puddle in the road ahead. So in my memo I warned that we could either step round the puddle, or step right into it, and risk being drowned. In 1995 none of our products made use of TCP/IP. Now, a decade later, I can safely say that many of them do. In 1995 I warned that we risked losing the mindshare of a new generation of internet software developers who chose to shun Microsoft APIs completely. Now, a decade later, I can say that close to 100 per cent of Internet-born viruses, Trojans, rootkits and worms use Microsoft APIs exclusively. However, to lead we need to do far more. In order to execute on this opportunity we must look as if we're acting quickly and decisively. Recently competitors [Steve, chair down. DOWN.] have gained massive public attention by rolling out products that remain in beta for many years. This is unacceptable. Products that remain in beta for many years should be first and foremost, in the public's mind, Microsoft products. For three months Ray Ozzie has been sitting in his orgone accumulator devising a strategy to ensure we can execute. I've attached a memo written by him that I think strikes the right balance between pre-announcement and non-delivery. I'm happy to share it with you. Scoble asks what you call 'em? Raw Potatoes! Scoble asks what you call things like Flickr, Microsoft Gadgets, Google Maps, Amazon Affiliate parts. I’ve been struggling to communicate with others what the new Internet ecosystem is made up of and it hit me a few minutes ago. They are Internet Connected Components. ...I think we need a non-branded name to generically refer to these things. What do you think? Here's my proposal: raw potatoes. Why? Because they're what you mash up. If you call 'em rawpotatoes (no space) you can create a nice searchable tag/phrase that doesn't currently mean anything else. When's the last time you saw a search result this empty? Hats off to Chris Law for reserving the URL already. I'm sure he'll be happy to build it as an open community resource for Web 2.0 just like he's done with WSFinder. In general, if you are displaying mashups featuring Yahoo! Maps on your site or application and you make your stuff available for free to users, you’re welcome to use the Yahoo! Maps APIs. This is true even if your site is supported by ads -- even ads from other vendors. But while I've got you thinking about monetizing your site, allow me to make a shameless plug for something else we’re doing at Yahoo! -- take a look at the Yahoo Publisher Network BETA. Revenue, relevant ads, no hassle. Easy. Sign up today for your YPN beta invite. Check out my follow-up post at the Zvents blog for the rest of the story. The Zvents team is now going to get back to work building product. Google, Yahoo, Scoble, we love you all. Peace and APIs. Yahoo launched a cool new maps service today, which got great reviews, tons of buzz, and complaints about commercial restrictions. They also got a "Yahoo Maps are Doomed" post from Robert Scoble, in which he used my company Zvents as the poster child for Google's ongoing dominance. Not so fast, Robert. More on this tomorrow, but I just got off the phone with the Yahoo Maps team, and they said that tomorrow they will be removing the "non-commerical only" clause from their TOS, and that Zvents, as a commercial site, is "golden" to start using their APIs. Robert has raised some fascinating points in his post. I'll address those on the Zvents blog tomorrow morning. Watch that space.